We are happy to inform you that your site David Hellmann — Designer. Developer. Cyclist. has received an Honorable Mention. This special honor is given to websites that achieve a high score in our user vote, and will bring you greater visibility and prestige with an entry in our Honorable Mentions section. Receiving an Honorable Mention also carries 100 Status points. We want to congratulate you and wish you luck in the rest of the competition. Thanks to all that vote for my website. You're great, yeah! 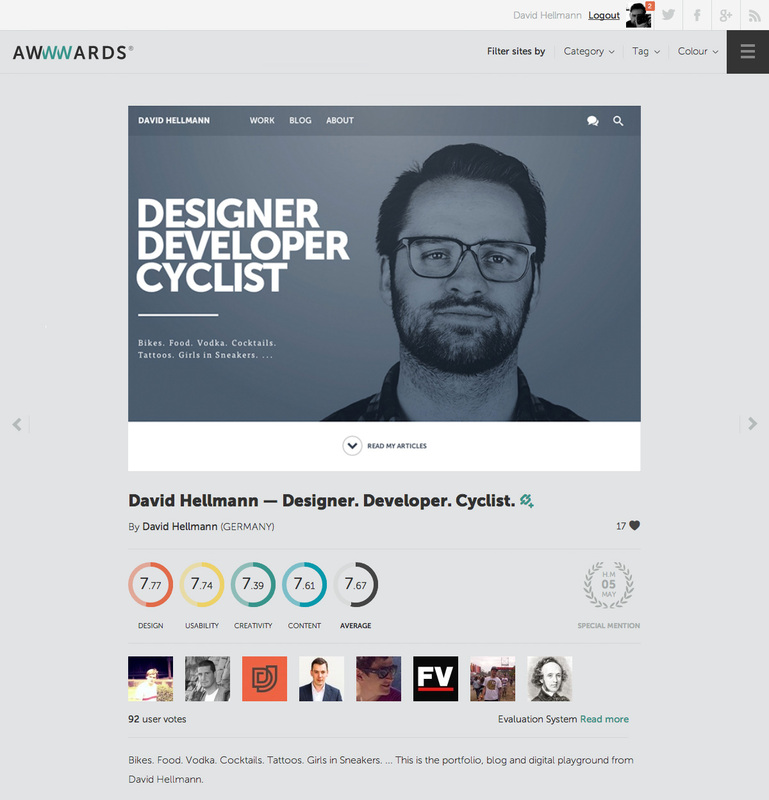 :) Now you can click on the little Heart to give another like for my website on the AWWWARDS Page. prev article Relaunch. Sketch Arbeitsdatei. Sass. next article #changeCGN — Minirampe gegen hässliches Köln! #May1Reboot — Alles neu bringt der Mai. Relaunch baby! Joining Austria. Joining Salzburg. Joining Red Bull Creative. Hello!